I have got inspired by passsionate speech at TEDIndia by Kiran Bir Sethi and I would like to ask you. “I can” ? And what action did you take? I cannot wait to read your thoughts! umm….i always say i can do it….nomatter iss whtever…..i do my best try my hard to do it…..!! Great attitude! ;-) One cannot lead wrong way, when always doing his best. “I can”… it’s very simple but strong phrase, which should be spreading from human to human everytime we can…and we realy can! “I can…” Im trying it everyday… Mostly when I feel like Im in really big hole, sad or whatever. Hm… I think that harder is start to do something. “I can” is just some phrase. But to make first step, this is important – to find strength to start doing what you want to. Great Lucia, every day is a new chance for us to do our best. I am excited to hear about your accomplishments and I appreciate you are sharing it with us! 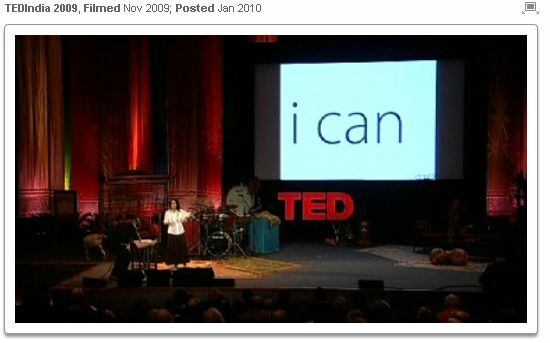 Thank you:) yes the phrase “I Can” has great power for our lives. So, why didn’ t use it ;)?